In its response to the request for clarification of the TEC , the UGC insists she has not given the green light to Eastern Institute of Learning in Management University ( EIILM ) Sikkim operate in Mauritius. This correspondence was sent to the TEC by the Indian High Commission . In it , the UGC also scratched four other tertiary institutions ( Mauras , JSS Academy, Arya Sabha and Intraconsult ) affiliated to Indian universities . Like EIILM University Mauritius Branch Campus , they would illegally, said that correspondence. It states that although EILLM Sikkim University is a private state institution , it shall obtain the prior approval of the central government to offer courses outside of India. The TEC and the Minister Jeetah are not of this opinion. TEC had told the press recently that these universities could operate in Mauritius. The Minister of Higher Education himself has said Maurice had its own laws. This is what he had to say again Thursday to Rajiv Gandhi Science Centre, St-Pierre, before deploring " false campaign" opposition " to disparage " tertiary institutions. In addition, Alan Ganoo , who met Akhilesh Gupta, secretary of the UGC during a recent visit to India , told The Sunday / L'Hebdo that about Jeetah " is irresponsible ." "It is his duty to ensure that these diplomas are recognized tertiary institutions around the world . I ask the minister Jeetah confirm if this is the case. These students rely on these qualifications for their professional future , "he said, while claiming that the response to the UGC TEC is " published " . The opposition leader also stressed , as Sir Jugnauth , the need to establish a commission of inquiry. " It will shed light on many gray areas , including a letter dated 2007 that Nando Bodha tabled in the National Assembly. The letter emphasizes that even qu'EIILM not start its activities in Mauritius, the UGC had said she did not recognize EILLM Sikkim as a university in India. The TEC has failed, it is clear , "says the leader of the opposition (Document 1) . Beyond the recognition of diplomas at the international level , the authorization EILLM Sikkim to open a campus plot. A source close to the Ministry reveals that according to the National Policy Framework of the TEC , the institution must have a brand name in the country . This to ensure a quality education. "But there is a significant anomaly at this level. How was she able to get a reputation if it was licensed April 17, 2006 , one year before the EILLM begins to operate in Mauritius ? The TEC has violated its own rules , " said the source . The National Policy Framework of the TEC makes it clear that the promoters of a tertiary institution must ensure that it is a " Recognised accredited university in icts home country " ( Document 2) . However, that does not state the case in 2007 . 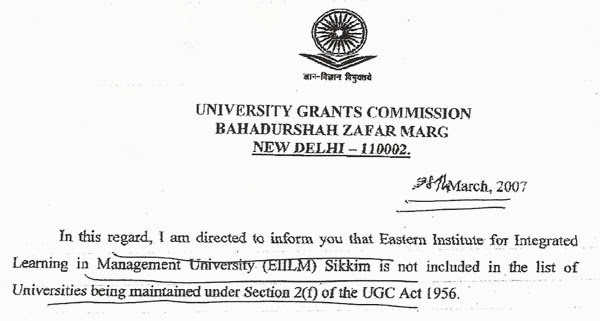 It was not until 2008 that EILLM UGC recognized Sikkim as a university in India. This contradicts the minister who said Jeetah qu'EILLM Maurice had " adhered to all the regulations of the National Policy Framework of the TEC ." But the controversy concerning the establishment of an "offshore campus " remained until around Mauritius ' publication of a Public Notice dated June 27 , UGC , saying " no permission has been granted to any private university to establish a campus or research center at the abroad. " So, the recognition of diplomas EILLM Mauritius is questioned. As exit , Sunil Jeetah and Minister Rajesh Jeetah had argued that a private university ( as EILLM Mauritius) did not fall under the umbrella of the UGG . At least for its regulation. However, a document is in our possession show that UGC ( Establishment of and Maintenance of Standards in Private Universities ) Regulations, 2003 , governs EILLM Sikkim India ( Document 3) . Another anomaly is likely to embarrass the former leadership of the TEC . It involves a three- year term between TEC and UGC since 1998. In the original agreement, it is about collaboration and a " commitment " between the two parties on the accreditation and recognition of institutions under clause 10 of the agreement. When Ramnath Jeetah Trust gets its registration , the agreement is still valid. It will not be the case on March 4, 2010, at the renewal of this agreement . Les universités publiques devraient soumettre leur rapport à la fin de ce mois. Elles avaient été sollicitées par la Tertiary Education Commission (TEC) pour se pencher sur la reconnaissance des diplômes qui ne sont pas conformes aux règlements de Maurice. La faculté de médecine basée à Belle-Rive se retrouve de nouveau au centre d’une controverse. Ses étudiants dénoncent l’état de ses infrastructures ainsi que le manque d’hygiène. Le SSR Medical College a été sommé de remédier à la situation dans les plus brefs délais. La liste d’institutions d’enseignement supérieur vers lesquelles les aspirants médecins devront se tourner pour leurs études suscite encore des remous. The TEC should it get the green light from his Indian counterpart, the UGC before allowing a university in the Great Peninsula to set up in Mauritius? An agreement signed in 2010 between the two understand that leave no ... But the UGC has repeatedly said she did not recognize the diplomas outside the territory. Le gouvernement veut faire de Maurice une référence régionale pour les études supérieures. Toutefois, ce projet peine à décoller.